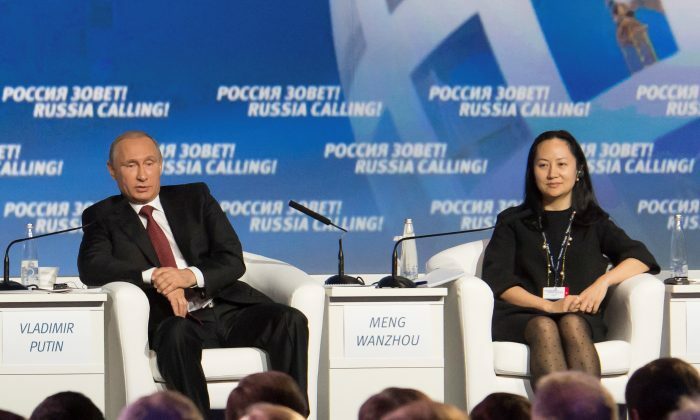 HONG KONG—Like many top Chinese executives, Meng Wanzhou is a mysterious figure even in her home country, but the 46-year-old chief financial officer of Huawei Technologies had been widely tipped to one day take the helm of the tech giant her father founded. That was until her shock arrest in Canada at the request of U.S. authorities on Dec. 1, a move that has entangled her in the protracted diplomatic tensions between Washington and Beijing. Her fate is now uncertain. A source familiar with the matter told Reuters the arrest stems from Huawei Technologies Co Ltd’ alleged violation of U.S. sanctions on Iran. Similar allegations of breaching U.S. export restrictions led to rival Chinese telecoms equipment maker ZTE Corp being hit with a devastating ban and heavy fines this year. Huawei said in a statement that it had been provided with little information “about the charges” against Meng, who is also one of the vice chairs of its board and the daughter of founder Ren Zhengfei from his first marriage. The detention of Meng, who takes her family name from her mother and has also used the English first names “Cathy” and “Sabrina,” has once again thrown the spotlight on Huawei at a time of heightened global concerns over electronic security. Officials in some governments, particularly the United States, have voiced concern that his company is close to the Chinese military and government. Huawei derives around half of its revenue from supplying equipment to telecoms carriers around the world. It has overtaken Sweden’s Ericsson and Finland’s Nokia to be the world’s largest telecoms equipment maker by revenue. Smartphones have become another key business in recent years, pitting it against Apple Inc and Samsung Electronics in the highly competitive market. CORRECTION: A previous version of this article incorrectly stated the day Meng was arrested. Meng was arrested on Dec. 1, 2018. The Epoch Times regrets the error.